Padraig Harrington landed two major end-of-season awards and vowed to quit the game before giving up his bid to get even better. The Dubliner, 37, earned the European Tour ‘Golfer of the Year’ and the AIB sponsored Irish Golfer Writers’ Association ‘Professional of the Year’ gongs for the second year running after grabbing back-to-back Major wins this summer. And he immediately promised to give up golf before giving up his bid to improve every aspect of his game. “When I come out next year I will be focused on getting my game ready for every week and building up for the Masters Tournament at Augusta National. “I know the Masters will be the hardest Major for me to win because of the attention that will be on me. “It is a lot easier to go into these things with a little less profile and stay patient for two or three days under the radar and finish it off on Sunday. Ranked fourth in the world, Harrington reflected on a magical three-week spell that saw him successfully retain the Claret Jug at Birkdale before becoming the first European to win the US PGA for 78 years. He said: “The week of the Open Championship I went out and played great, I really did. But to go out and win the US PGA Championship three weeks later was incredibly exciting. Harrington’s mantelpiece is already groaning after he landed the European Tour’s 'Shot of the Year' and the PGA of America’s 'Player of the Year' awards. But he is also fancied to pip Tiger Woods for the PGA Tour’s prestigious Jack Nicklaus Trophy when the votes of the US tour players are tallied later this week. Cavan twins Leona and Lisa Maguire and Offaly’s Shane Lowry won the AIB Irish Golf Writers’ amateur awards with Brendan Edwards the recipient of the ‘Distinguished Services’ honour. 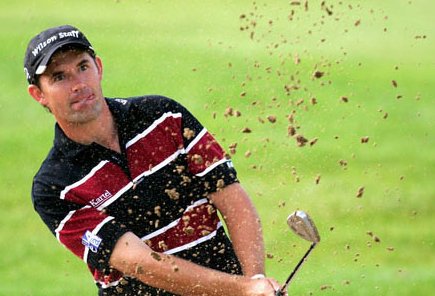 Padraig Harrington refuses to believe he’s finished as a major contender. Far from it. Not only that, the determined Dubliner is convinced that Tiger Woods will storm back to form and smash Jack Nicklaus’ record of 18 major wins.